First, I do not make New Year’s resolutions, but I do love the New Year. I find it is a time to reflect on my life during the past year and contemplate the upcoming year. It feels like a time to start anew and perhaps do something different from the previous year. I have found that just wanting to change in the New Year and actually doing something different are two different things. This is the time of year when weight loss programs fill up and it is hard to find a seat. It is also the time when gym memberships go up and it is tough to find an open machine. Ultimately the gym and the weight loss center become less crowded as people taper off after March when the New Year’s resolution goes out of mind. How about a different resolution this year? I resolve to appreciate my body the way it is right now. I know it isn’t where I want it to be, but for right now it is how it looks. I resolve to take a deep breath and check in with myself before I eat to see if I am physically hungry. 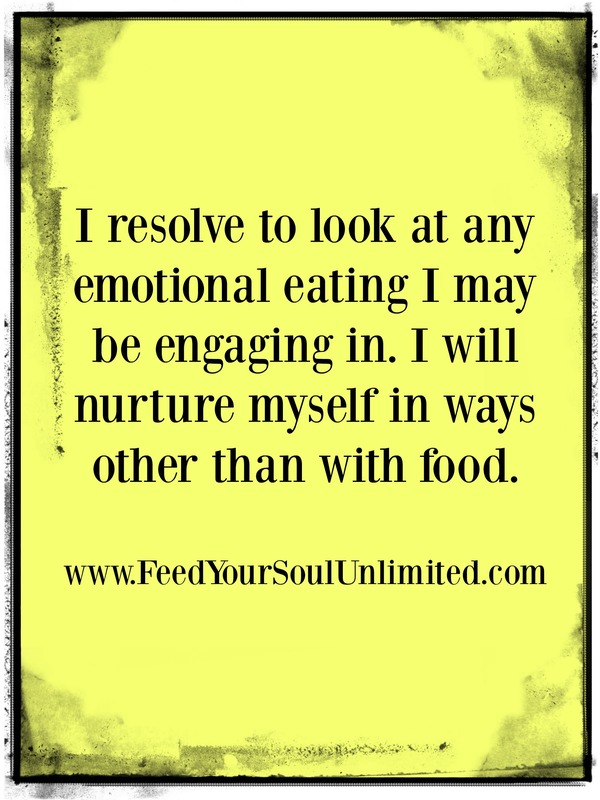 I resolve to look at food as nourishment for my body. It helps me have the energy level I need to get things done. 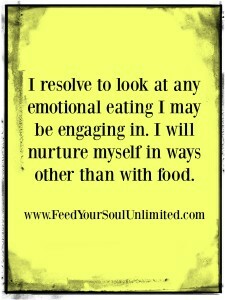 I resolve to look at any emotional eating I may be engaging in. I will nurture myself in ways other than food. I resolve if I do not accomplish the above- I will not get angry with myself. I will treat myself with kindness. Any one of the above resolutions could make a significant change to help you start putting food in its proper place as nourishment. Any of the above could be what you need to start this New Year off in a different way to accomplish the goals that you set for yourself. Have any resolutions to add? I would love to see them in the comments below.